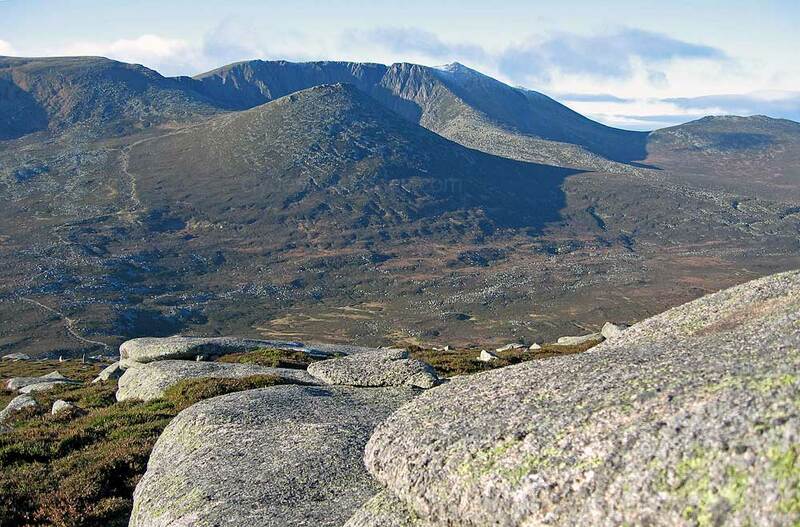 Includes Lochnagar and hills around Glen Muick, the White Mounth and Mount Keen, the most easterly Munro. Lochnagar intro* ​Below: On the walk-in from the road end in Glen Muick: Lochnagar lies straight ahead with the rounded lower slopes of Conachcraig on the right. 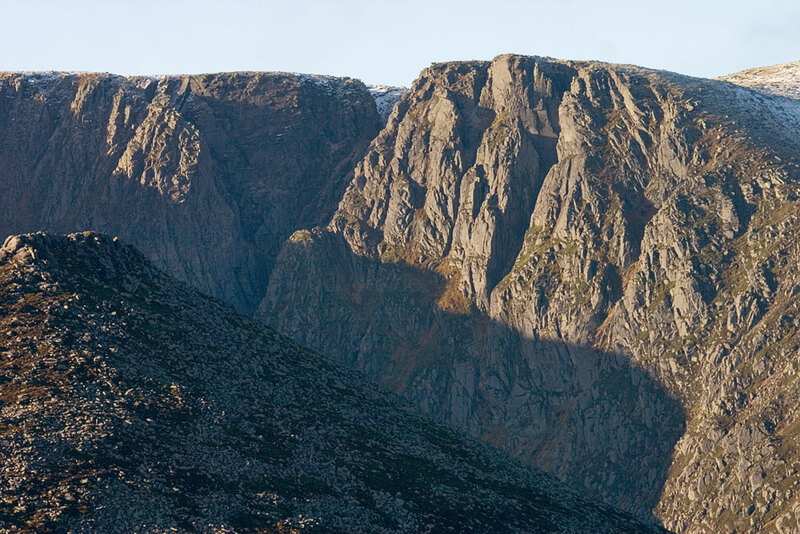 This was intended to be a two-day camping expedition to take in some of the numerous Munros and subsidiary tops in the Lochnagar area, however, a last minute unavoidable commitment for the second day threw a spanner in the works. I decided to make it a one day trip and arranged to meet a pal at the Glen Muick car park about 6 a.m. At dawn the weather looked settled and there were lots of deer at the starting point. We took the decent track to Meikle Pap, one of Lochnagar`s subsidiary tops which offers good views of the cliffs opposite. As we walked round the corrie to the main top it became very windy and we could see masses of cloud building up over the Cairngorms. While standing near the summit at the cliff edge we were startled by a loud crack. A cornice had broken off, causing an avalanche to pour down the gully below. We watched as a substantial amount of snow was channelled down, reinforcing the fact that it was not a good day for climbing on the face. As we headed west to Carn`a Coire Boidheach on The White Mounth, the bad weather struck. Visibility dropped to almost nil and once at the summit, we decided that there was no point going any further. With the wind howling, I helped my companion pitch his tent on the plateau, just short of the cliff edge. He opted to sit tight until the following morning, hoping that things would improve but I was now glad that I had an excuse to bail out. ​I took a compass bearing and headed off the hill, navigating to a subsidiary top, then dropped down to pick up the track near Dubh Loch (above). It was here that I finally got below the clouds but it was still a very gloomy scene. The weather never improved the following day and I was grateful to spend it mostly at home in front of the fire. My pal persevered and did all the subsidiary tops by compass but he got no view. The above view taken from Conachraig shows the normal approach to the top of Lochnagar from Glen Muick. A good trail leads to the corrie rim. Warm but cloudy day. I started from Glen Muick to complete the Dubh Loch and White Mounth tops. An excellent Land Rover track goes alongside the loch, and rises steadily almost to the summit of Broad Cairn and this made for a relatively quick ascent. Standing at its cairn above the Dubh Loch, there`s an excellent view. 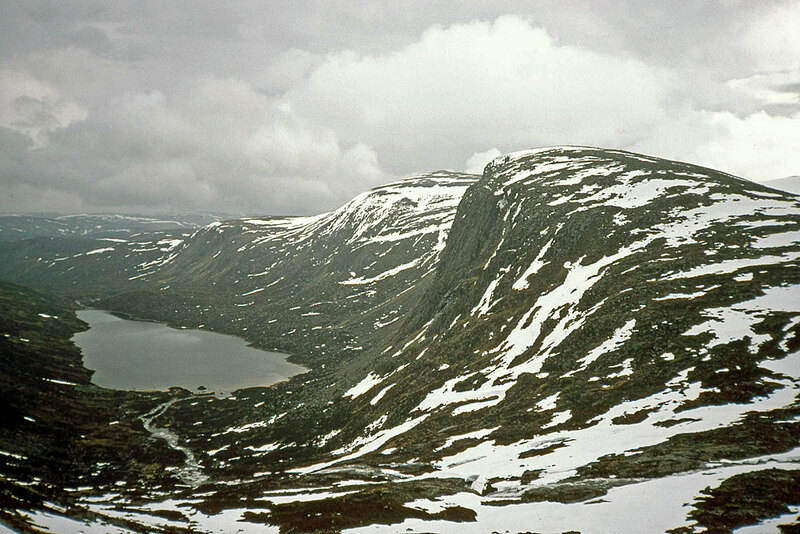 In two kilometres the burn from the loch drops almost 800 feet into Loch Muick. This was an area much frequented by Queen Victoria during her Balmoral days and she often made trips on the loch, her boat pulled by three ghillies while a piper blasted out a tune. After a snack I wandered over the plateau knocking off Broad Cairn`s subsidiary tops, along with those of Cairn Bannoch. 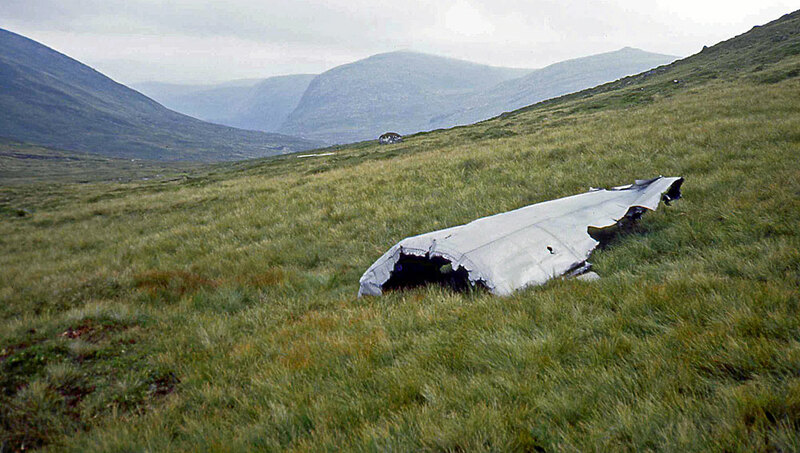 On the way over to Carn an t-Sagairt Mor on the White Mounth I came across the scattered wreckage of a Canberra bomber. The Canberra was designed as a direct jet replacement for the RAF`s famous De Havilland Mosquito and first flew in 1949. The name Canberra was allocated in acknowledgement of the aircraft`s first export order which was placed by the Australian government. The aircraft proved very successful in service and also set several world altitude records. In 1951 it was the first jet aircraft to make a non-stop crossing of the Atlantic. 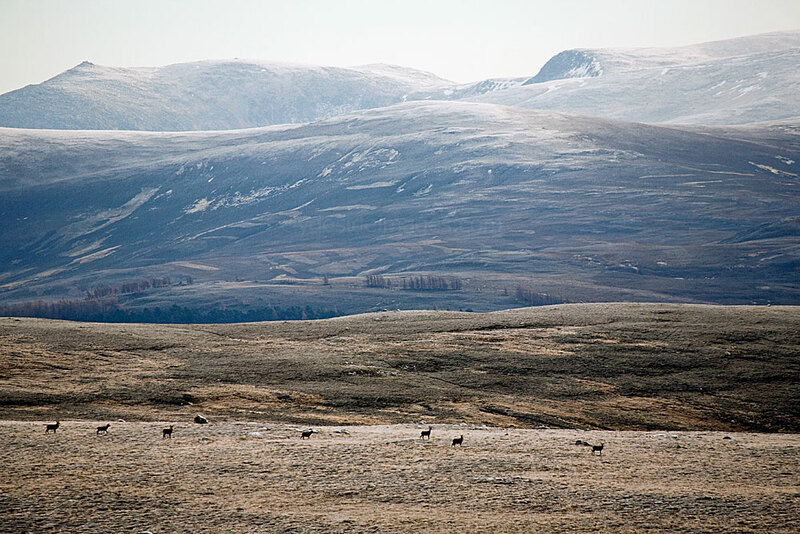 // the lonely expanse of mountain wilderness on the vast White Mounth plateau. 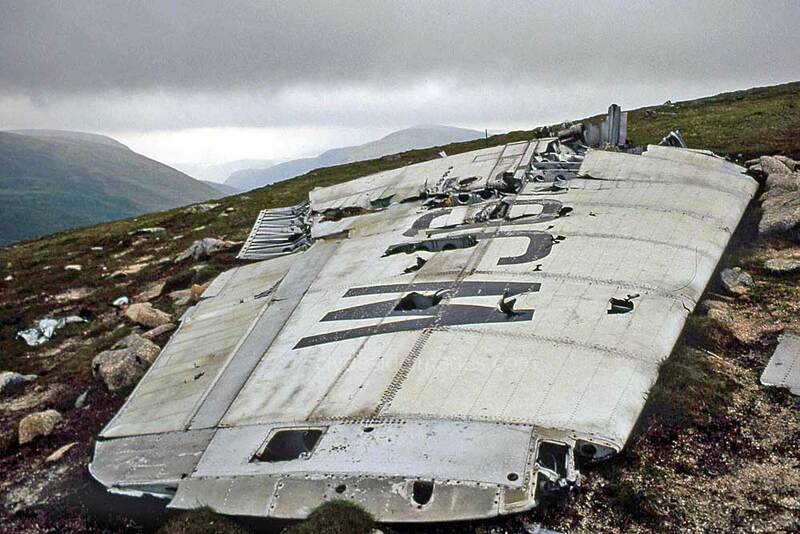 It is only one of an estimated 4,000 aircraft that have crashed in Scotland over the years. Unsurprisingly most are military aircraft which came to grief during the Second World War, not only flying missions but on ferry flights and training exercises. 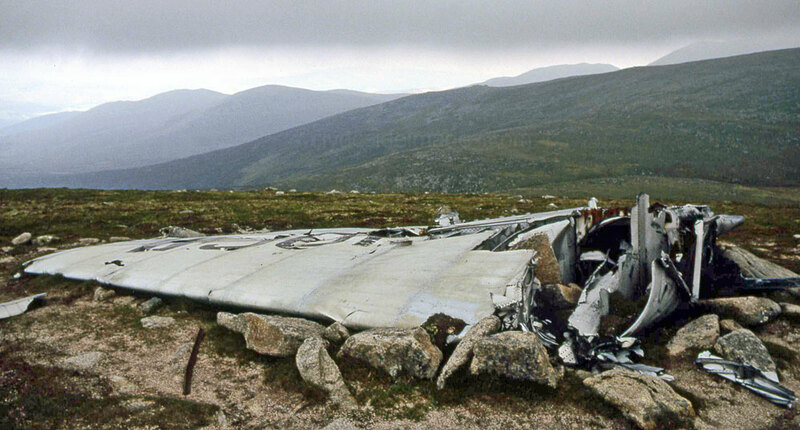 In most cases the remnants would be salvaged and taken for examination to determine the cause of the crash but there are numerous sites where at least some trace of the aircraft remain. Occasionally, if the site is particularly remote or inaccessible, large sections of the wreck may be left behind. After visiitng the last top, I returned to the car via the track on the north side of Loch Muick, passing the lodge at Allt-na-guibhsaich, the first and most famous of Queen Victoria`s Royal shiels. Fine summer day despite some cloud. Early start from the car park near the Youth Hostel in Glen Doll and, after ascending Dreish and Mayar, I continued north for a few miles over the desolate plateau to take in Tom Buidhe, Tolmount and the latter`s subsidiary top of Crow Craggies. Navigation would be a nightmare here in bad weather. After Crow Craggies I followed Jock`s Road back to the head of Glen Doll. Davy T : We disturbed a Heron as we walked along Glen Mark, following the River Esk and could hear deer high on the hillside opposite but it took a few minutes to spot them. Soon after, we passed the memorial known as the Queen`s Well, a large concrete monstrosity shaped like a crown, erected over the spot where Queen Victoria and Prince Albert stopped for a picnic in 1861! A very easily graded Landrover track, leads almost to Mount Keen`s summit and we knocked over an hour off the book time. Definetely* one of the easier Munros. A large stone shelter has been constructed beside the cairn and we sat in there sheltering from the cold wind while we ate our piece. There were even a few spots of rain but, when we next looked up, a rainbow had put in an appearance. On the way back we met a lone walker heading up, the only other person we saw, and he was also surprised at how easy the going was.